Coin Collection is one of four randomly selected bonus stages after completing a World in Dance Dance Revolution: Mario Mix. 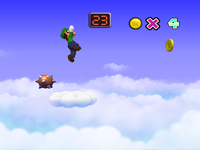 In this minigame, Mario or Luigi must jump to collect all the coins as they can while riding on a cloud. Mario or Luigi also need to avoid getting hit by the Spiny Eggs floating in the air, or they'll get knocked away from the clouds with Lakitu carrying them back. Collect the floating coins while avoiding the vicious Spinies. This page was last edited on March 5, 2019, at 09:03.